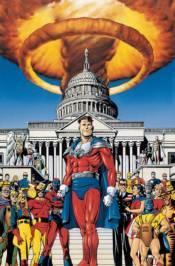 Set at the start of one of the darkest periods of U.S. history, the infamous 'McCarthy Era,' JSA: THE GOLDEN AGE takes a thought-provoking look at what might have happened to DC's first generation of super heroes beyond their exploits during the Second World War, as paranoia pervades America. DC's first generation of super heroes have been driven into retirement or hiding, or madness-except for a few who are willing to change with the times. But behind the scenes, something even more sinister is unfolding-a subtle plot that may engulf the planet and remake it in one man's image. Collects THE GOLDEN AGE #1-4 in a Deluxe hardcover for the first time.